I love cats and have two of my own: Hilly and Sly. And yes, of course they have their own Facebook and Instagram accounts. Haha! About a month ago Sly suddenly fell ill. With cats it never really is “suddenly” though, is it. They are masters of disguise and by the time we humans have noticed that something isn’t quite right, whatever has been bothering them has usually progressed quite far. But this time Sly’s change was pretty rapid. When Sly hadn’t come in for dinner my husband and I weren’t really concerned as it had been a warm sunny Spring day and we presumed he was still out and about in the neighbourhood. Then we noticed him sitting in the bottom part of his scratching post. He usually sits and sleeps right on the top of his castle, peering down at his servants, and Hilly. But he had withdrawn to the lower part which is actually like a little cave. Perfect for cats to retreat to. This was Monday. The next day he appeared slightly better and was eating a little, but nowhere near his usual appetite. Nor was he chasing Hilly; a bad sign. On Wednesday he seemed worse so we made an appointment at our vet for Thursday lunchtime. He was sleeping a lot and purring to comfort himself. When he came down from his scratching post he was a sorry sight, once nearly falling over sideways. I sent my vet a text Thursday morning saying I might come in earlier and wait as Sly was so lethargic. She called me a few minutes later and told me to go to a bigger veterinary practice who can do blood checks in their own labs and have more diagnostic possibilities. With the weekend looming on the horizon this did seem prudent. Sly was so tired that my picking him up only met with feeble protest. We waited a good hour which isn’t bad for the big vet practice I went to and we had a really great doctor. Sly was such a brave boy when his blood was taken and he had a temperature! The blood counts showed an infection, but everything else was fine. He was administered 250 ml fluid subcutaneously (under the skin) as he was dehydrated. In addition he got medication to bring his temperature down and a tablet to stimulate his appetite. One of the blood tubes was sent away to another laboratory to check for possible cat diseases. By the time we got home Sly seemed more active. He came out of this transport box and headed straight for the kitchen. The meds were obviously working. Over the course of the day we fed him small portions of his favourite foods and treats which he ate eagerly. My husband took him for a walk in the garden and he was slow enough to be caught again and carried back into the house. Leaving an unwell cat outside who could possible sneak away and hide was not a risk we were willing to take. In the early hours of the morning we were woken by Sly being terribly sick. It seemed like everything he had eaten that day was now on the carpet. A sharp smell of bile immediately filled the room. We were worried. Where had this suddenly come from? While I cleaned up the mess my husband followed Sly into the kitchen where he immediately started eating some dry food. What!? At 5 am in the morning Sly desperately wanted to go out, but we had locked the cat flap. After a few minutes of knocking the cat flap and miaowing loudly he trotted off and then we heard him being sick again in the hall. But this time no smell of bile. Maybe he had just become upset and stressed about not being able to go out? A few hours later we got up pretty exhausted from the antics of the night. I feared the worse and I saw Sly and myself heading back to the vet. I opened up a fresh tin of his favourite food and took it to him. He immediately came down from his post – albeit slowly – and followed me into the kitchen. He gobbled up his portion and in the hour I took to get ready for work he ate two more small portions. He seemed much better and was beginning to notice Hilly again. A good sign. Things went uphill from then on and at the weekend he chased Hilly in the garden again for the first time since falling sick. Normality had been restored. The second set of blood results came back with no indication of any diseases. 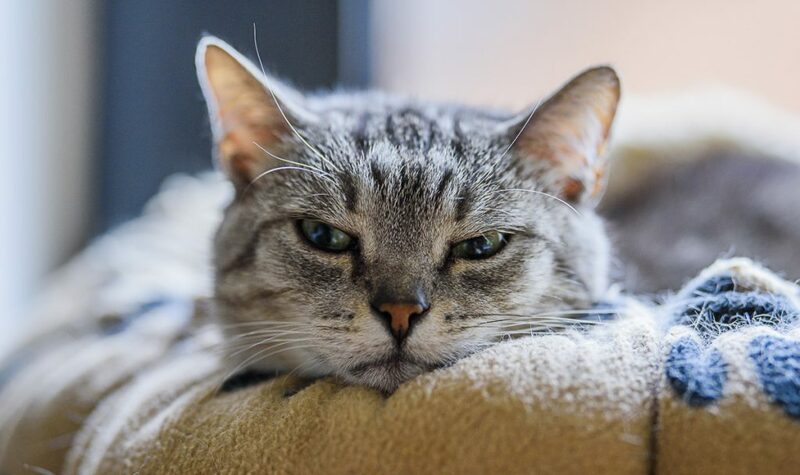 One count which is related to diabetes in cats was raised slightly, but the blood results performed in the surgery itself regarding glucose and diabetes related counts were all okay. Our vet suggests to check up on this in a few months time, but with Sly being back to normal again we are convinced that the reason for Sly’s sudden health deterioration was caused by the spot-on product against ticks and fleas we gave him a day before he fell ill.
Sly is an active outdoor cats and brings home quite a few ticks. Some we can brush off before they have attached themselves to him and the attached ones we remove with special tick tweezers. In addition there is the possible chance of him bringing home fleas. I live in Germany so the listed products are what is available here. But big companies like Bayer produce all over the world so check the active ingredients on the packet as these are international. Feel free to contact me regarding alternative products you are using and your experience with them via Facebook or Instagram. I have deactivated the comment section on my blog as I have only been visited by spam bots lately, very annoying. I also read that you should not use products meant for dogs on cats and vice-versa as the substances may differ and also the dosage. Herbal alternatives are often suitable for both cats and dogs. But make sure to always read the instructions carefully. I have never been a great fan of the chemical spot-on products available as their main active ingredient is a neurotoxin. 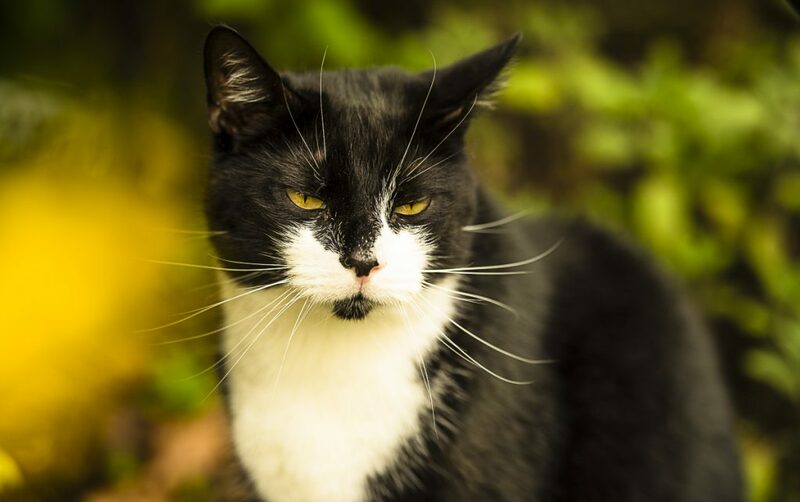 Spot-On products are applied onto a small region on the back of your cat‘s neck – where they can’t lick it off – and like a nicotine patch the substance is absorbed over the skin and enters the bloodstream. If a tick or flea bites it gets killed by the cat’s „poisonous“ blood. This protection lasts for about 4 weeks and it is therefore recommended to repeat the application every month during the main tick and flea season. In the past we have used all three products with the ingredients listed below. We never had any problems with fleas, but ticks still continued to attach themselves onto our cats although not in such great numbers. Also we stretched out the application to 8 weeks or longer depending how many ticks our cats had. “Effipro” is what we gave Sly last month and he still had 3 ticks on him afterwards. In the past I have used the spot-on product by the German company „Vet Concept“ which I have linked to below. The main active substance in this lotion is an oil extracted from the Neem Tree (aka Margosa). Our cats never had fleas and just like with the chemical spot-on products still a few ticks. So the product does seem to do the job. Please note that some essential oils can be poisonous for cats. So please never administer pur Margosa, citronella or lavender oils to your cats! We haven’t used collars as we are worried about our cats getting stuck somewhere and strangling themselves. Even if most collars nowadays do have a quick-release catch. The substances can be chemical or herbal and are continuously released and absorbed by the fatty layers of the cat’s skin and thus transported over the entire cat. As far as I have understood these substances don’t get absorbed into the cat’s bloodskin, but work by releasing an odour which fleas and ticks don’t like (herbal) or the substance released is poisonous and kills off fleas/ticks when they bite your cat (chemical). Some cats can react sensitive to the substance used in the collar (both chemical and herbal) and can scratch off the fur around it. If this occurs then take of the collar immediately and wash the area off with warm water. You might need to get a soothing lotion from your vet like we did for Emmie. Collars with herbal substances available here in Germany have the following ingredients. These substances don’t kill the fleas/ticks, but keep them away. The Swiss company Bogar I mentioned to above under herbal spot-on products offer two collars: One with Margosa and Citronella oils or just pure Margosa. Another herbal alternative I have read about is coconut oil. Apparently ticks don’t like the lauric acid it contains. It is applied by rubbing a small pea-sized amount in your hands until it melts and then rubbing it onto your cat’s fur (once a week). You can buy products “especially” for cats (and dogs), but if like me you cook with coconut oil or use it in your skin care routine then you can use this oil. Make sure it is 100% organic virgin coconut oil (not a cheap Hydrogenated oil!) I have tried this out last week and rubbed it into Hilly’s and Sly’s fur and skin around the back of their necks. Apart from smelling like a Carribean holiday they showed no side effects. As the chemical spot on is still active in Sly I can’t say anything about the effectiveness. Hilly hasn’t had a tick so far this year as she doesn’t venture out as far as Sly. I have also read that you can mix coconut oil into your cats food as well. But when feeding coconut oil to your cats a few aspects need to be considered, e.g. high calories. I would definitely check with my vet before feeding it to my cats, but externally it is apparently great for wounds, dry skin or paws, so an allround talent. I personally use coconut oil in my skin care and love it. A colleague of mine gives her dog dessicated coconut to eat as the fibres are supposed to be great against worms. Do indoor cats need protection? This is a personal choice. In my previous flat I didn’t have a garden. My cats didn’t go out and I didn’t treat them. If you were out in a park and picked up a tick unnoticed then it would surely bite you first instead of waiting to be brought home to bite your cat. 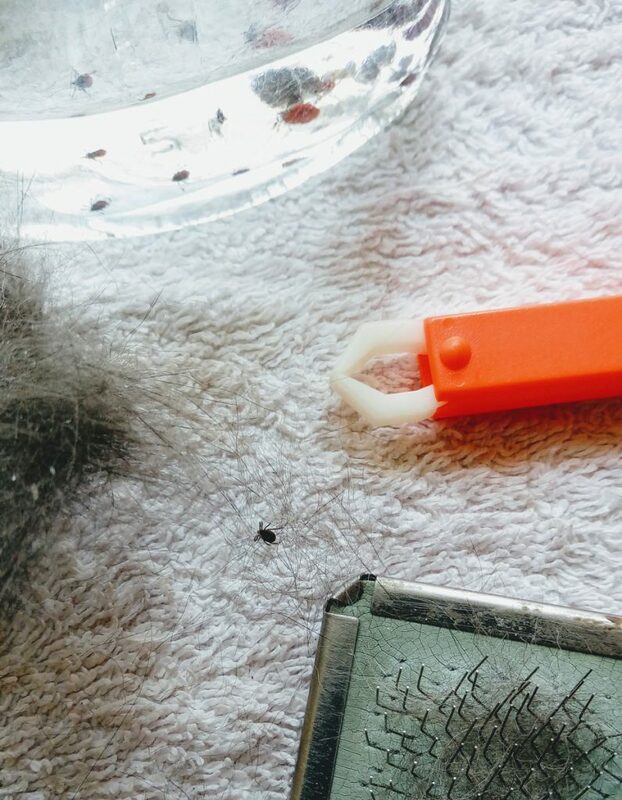 If you are in contact with other cats and dogs from friends then yes, maybe, there is a very remote chance of you picking up a flea and bringing it home. This happened to us once. My husband saw something hopping around on his desk: It was a flea, he squashed it. Game over. The Tabby Tux Trio (one of my Instagram friends) who lives in the States uses the flea collars Seresto and says that so far she hasn’t had any problems. Seresto is a brand by Bayer AG and the main active ingredients are Imidacloprid and Flumethrin. Both are chemical neurotoxins and Imidacloprid is used in Bayer’s Spot-On product “Advantage”. A totally different approach is taken by the German company Naturburg in their anti-tick spray “Zecki”. Based on the philosophy of flower extracts by Bach and nosodes they offer an energized spray suitable for both animals and humans. This tip was given to me by Sakura who owns and runs a unique pet-sitting company called Sakuras Tierbetreuung based in my hometown Dortmund. She swears by the spray and to keep the spray uptodate Sakura regularly sends in her ticks to Naturburg. When ordering pet owners living in Dortmund should order the spray made especially for Dortmund. The best additional protection is brushing your cat when it comes in. This has become a routine now with our cats and especially with Sly it has proven to be very effective. What do you do with the ticks? I pride myself in letting out all creepy crawlies and insects which venture into my flat, but I draw the line at ticks. I have a jar filled with 80% alcohol into which I drop them. My vet gave me this tip. When the jar starts to fill up and begins to get unsightly I tip the contents into the rubbish bin. This entry was posted in Beyond Baking and tagged Cat care.